(1) I know that geoengineering is often seen as a desperate measure, or a last resort, but now that the level of carbon dioxide is over 400ppm, the world is heating up faster. This would cause the methane locked up in permafrost to escape and to make the situation even worse. Methane has a more damaging effect than carbon dioxide but remains in the atmosphere for a shorter time compared to carbon dioxide. So maybe we need to stop this from happening and to reduce the effect of the additional methane in the atmosphere. An option would be the Pinatubo option, which would be to inject sulfur directly into the atmosphere, but what I would like to know is whether this would have any effects on the atmosphere. (1018) Yes, it would turn to sulfur dioxide cause acid rain for a start. 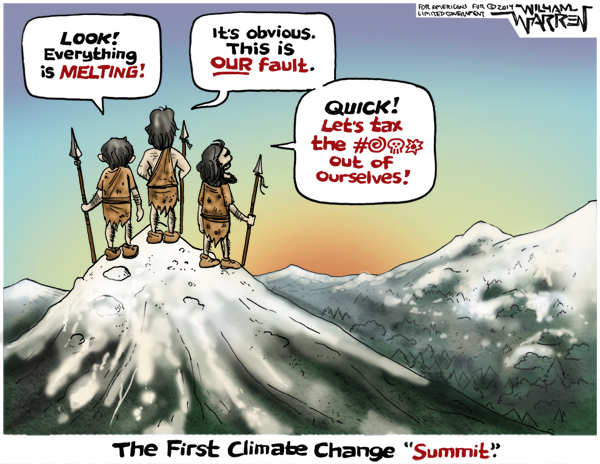 agaemmon wrote: ... but now that the level of carbon dioxide is over 400ppm, the world is heating up faster. The world is not heating up as far as anyone can tell and is probably cooling (indiscernibly). Atmospheric CO2 has no magical energy-creating superpower. agaemmon wrote: This would cause the methane locked up in permafrost to escape and to make the situation even worse. The situation is good, not bad. Atmospheric methane only makes the situation worse when someone farts and it smells bad for a moment. Correct. CO2 doesn't have any odor. agaemmon wrote: An option would be the Pinatubo option, which would be to inject sulfur directly into the atmosphere, but what I would like to know is whether this would have any effects on the atmosphere. @ jwoodward48, before you claim "No one is arguing for atmospheric sulfur-blasting" ... yes, there are warmizombies who argue this. Don't think this is by any means the first time this idea has appeared in warmizombie forums. (1018) I also recommend asking elsewhere if you want a sensible answer this forum is a troll-fest. (3425) I recommend ignoring the unhelpful religion-based trolls, e.g. spot, who won't be providing any value-added science. (1537) My side is tainted by idiots, yes. Why would we inject sulfur into the atmosphere? Why?! jwoodward48 wrote: My side is tainted by idiots, yes. Why would we inject sulfur into the atmosphere? Why?! Answer: To eliminate the CO2 pollution threat and kill all life on the earth's surface in the process! (1537) When you see a claim that a common drug or vitamin "kills cancer cells in a Petri dish", keep in mind: So does a handgun. I thought it humorous and relevant.